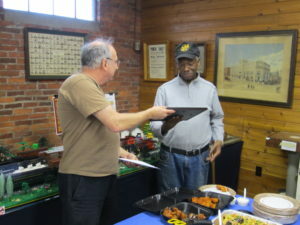 The Red Lion Train Station Model Railroaders (an affiliate of the Red Lion Area Historical Society) operate a multi-level 400 square foot fully detailed O-gauge model railroad layout in the former warehouse of the Station. The layout is open free to the public during the Train Show in York, the Red Lion Street Fair in August and throughout the Christmas holiday season. Special group visits can be arranged by calling 717-246-2982. 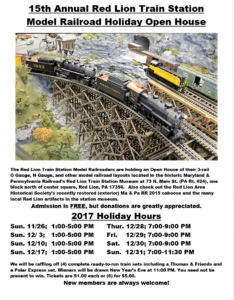 The Model Railroad will now be open and running on the second Sunday of each month, from 2:00- 4:00. Tour the Museum and visit the layout too! From the intersection of Routes 30 and 83 in York, PA: Proceed 3 miles East on Route 30 to the Mt. Zion Road / Route 24 interchange, exit and turn right at the traffic light onto Mt Zion Road / Route 24 South. Proceed 6 ½ miles on Route 24 S to Red Lion. The train station is located on your left just past the signal to light at High St. Look for the “OPEN” flag and sign. 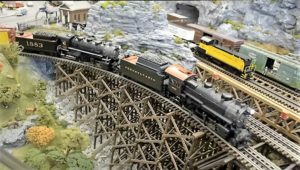 Model Railroader Everett Meehling created this video showing the layout. Don’t forget to turn up your volume. Here’s another of Everett’s projects, a “real railroading” video that is a full length documentary he and a friend worked on for about a year, all about the Western Maryland Scenic Railroad’s No. 734. 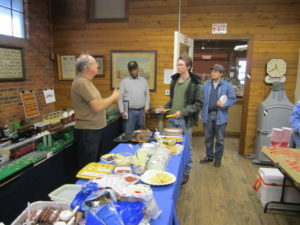 On January 14, 2017, the Model Railroaders held their Friends and Family event. 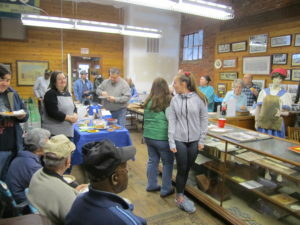 Everyone enjoyed wonderful food, good friends and a chance to view the layout from top to bottom. Everett Meehling was presented with a scholarship. Retiring long-time President Ed Austin was presented with a certificate of appreciation for his service by new President Jerry Smith. Ed received a gift certificate for dinner too. It was commented that this was the first time Ed had been at a loss for words. Best of everything, Ed!